*** SPACIOUS AND IMMACULATE *** 3 DOUBLE BEDROOMS *** MODERNISED AND REFURBISHED IN RECENT YEARS*** LEVEL WALKING DISTANCE TO MARKET PLACE *** Entrance Hall, Lounge, Kitchen/Dining Room, 3 Double Bedrooms, Bathroom/WC, Garage, Driveway, Front and Rear Gardens, Gas Fired Central Heating, UPVC Double Glazing. NO FORWARD CHAIN. ENTRANCE HALL Coving, telephone point, cloak cupboard, radiator, cupboard containing wall mounted Worcester gas fired Combi boiler, drop down hatch to loft space. Double glazed entrance door to front. Double glazed window to front. 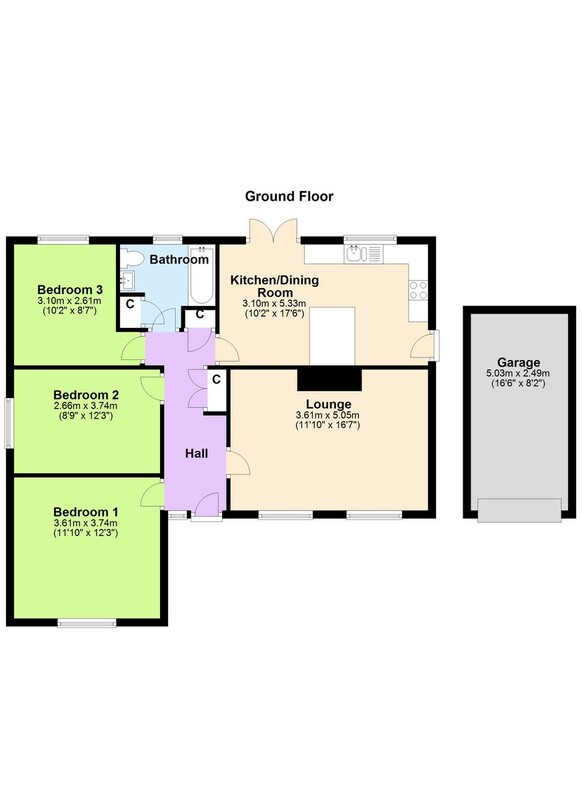 Doors to Lounge, Kitchen/Dining Room, Bedroom 1, Bedroom 2, Bedroom 3 and Bathroom/WC. LOUNGE 11' 10" x 16' 7" (3.61m x 5.05m) Cast iron multi-fuel stove, coving, television point, two radiators. Double glazed windows to front with vertical blinds. Door to Entrance Hall. KITCHEN/DINING ROOM 10' 2" x 17' 6" (3.1m x 5.33m) Coving, tiled surrounds, dark oak effect laminate work surfaces, cream matt cupboards with under unit lighting and drawers with chrome handles, built-in electric oven and four ring gas hob with stainless steel/glass extractor hood over, built-in fridge, built-in freezer, built-in dishwasher, plumbing for washing machine, fitted breakfast bar, ceiling LED spotlights, television point, two radiators. Double glazed entrance door to side. Double glazed window to rear. Double glazed double doors to rear. Door to Entrance Hall. BEDROOM 1 11' 10" x 12' 3" (3.61m x 3.73m) Coving, radiator. Double glazed window to front with vertical blinds. Door to Entrance Hall. BEDROOM 2 8' 9" x 12' 3" (2.67m x 3.73m) Coving, radiator. Double glazed window to side. Door to Entrance Hall. BEDROOM 3 10' 2" x 8' 7" (3.1m x 2.62m) Coving, radiator. Double glazed window to rear. Door to Entrance Hall. BATHROOM/WC Fully tiled walls, hand basin in vanity unit with white gloss cupboards below with chrome handles, panelled bath with shower over and screen, extractor fan, low level WC, fitted wall mirror, built-in shelved cupboard, ceiling LED spotlights. Double glazed window to rear. Door to Entrance Hall. FRONT Lawn, flower beds, shrubs, tarmacadam drive, canopy over front door with outside courtesy light. GARAGE 16' 6" x 8' 2" (5.03m x 2.49m) Power connected. Up and over door to front.